Hannah Genders revels in the sights and sounds of a traditional country fair. I popped down to the Malvern Autumn show, which is always held at the end of September, on a beautiful sunny day which seemed to extend the lovely summer we’ve enjoyed this year. I was reminded of how peculiarly English many of the show’s features are, and it was truly wonderful! In the Harvest Pavilion there were displays of giant vegetables; a parsnip over five metres long and a carrot that weighed in at 8.35 kilos were just some of the delights. Of course, these vegetables would probably taste terrible but the sheer size of them makes you feel like you have entered another world. If you talk to any of the competitors, all the recipes and techniques are a very closely guarded secret. The displays range from all kinds of vegetables (leeks, carrots, onions) to cut flowers like dahlias and carnations. I would recommend anyone to go for the sheer enjoyment of this feature alone. Outside the Harvest Pavilion the show has developed a vintage section which is growing each year. Caravan enthusiasts bring the most exquisite old caravans I have ever seen, some of the older ones dating back to the 1920s. 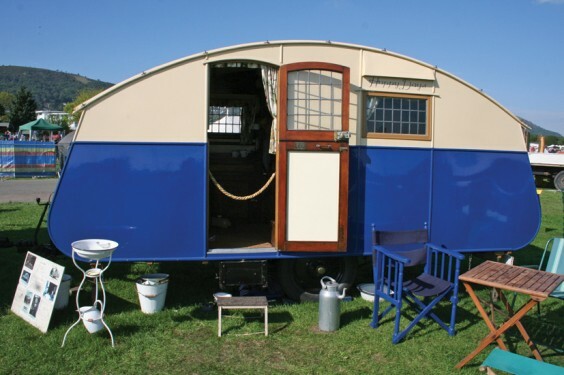 You can meet the people who own them and look inside to see the authentic interiors, complete with old crockery (when the caravans were originally sold, many came with a complete set supplied) plus books and guides collected by the owners. All the vans are lovingly restored and used for holidays as well as showing at events like Malvern. The society seemed a close-knit group where everyone knew everyone else – it was delightful. Once you have looked around the caravans and vintage tractors, what could be better than an English cup of tea and a piece of homemade cake? This is provided in the “village hall”, decked out with bunting and vintage clothing stalls, with tables and chairs set up in the middle and a local company supplying cake and tea in china cups – fabulous. Next door to the village hall this year was a tea dance tent, with a very good jazz and blues band playing and dancing demonstrations going on for most of the day. It created a wonderful atmosphere, and I spent ages just watching the couples twirling around the floor. Back to the produce! Along with all the vintage nostalgia, the other thing we Brits are good at is growing apples and this show is the place to see them. With a whole tent devoted to apples and pears, there is every sort of English fruit you could possibly imagine. One that caught my eye was labelled “Bloody Ploughman”; it was a large, deep red apple with very ribbed patterns in the skin. The story goes that a ploughman was caught stealing apples by the gamekeeper on a Scottish estate in 1883 and was shot – we have no record of whether he survived, but his wife took the apples and threw them on the rubbish heap. The seedling that subsequently germinated and was developed gained the name “Bloody Ploughman” by another worker on the estate. These and other stories are part of the rich history that can be discovered at the show. There are lots of opportunities to taste the apples and talk to the experts, or if you prefer there is plenty of cider and perry tasting too. There are few gardens at the show, only four in total and not as large as the gardens at the Malvern spring show, but very interesting in that they are called edible gardens and are required to have 80 per cent of the planting as edible, herbal or medicinal. As this show is all about produce, the gardens form part of a demonstration for cookery too – Mary Berry had been there on the first day to do some cooking, which had evidently drawn large crowds. I must say I really enjoyed my visit to the show this year and would thoroughly recommend it – it felt like I’d been to a traditional English country fair, just on a bigger scale.